Claim All of Your Savings This Tax Season! Community Clean-up Season, Utility Bill, 2019 Census, and more! Walden residents are actively engaged in their community and keeping them informed is our top-priority. 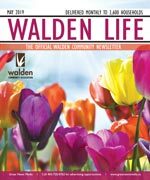 Walden Life is the official community newsletter, and covers community news and is published monthly to keep content current and relevant. Delivered to every household, apartment, and business, every resident is acquainted with the community’s most important information. The Walden Community Association is a volunteer run organization that represents the residents of the community of Walden. The association liaises with government officials, expresses resident concerns regarding commercial, industrial and residential land use development and represents the position of the residents on education, transportation, environmental and infrastructure issues. In the City of Calgary's 2012 municipal census, Walden had a population of 935 living in 450 dwellings, a 57.4% increase from its 2011 population of 594.With a land area of 2.4 km2 (0.93 sq mi), it had a population density of 390/km2 (1,009/sq mi) in 2012. For more detailed info visit the City of Calgary community profiles site.